It goes without saying publishers need to invest on good editors. They are almost as vital as the writers themselves. Being in Korea, I notice that editing English text seems to be more of a discretionary afterthought; that is if it’s even considered at all. It’s really a shame that a country that is so invested in learning English, people aren’t really concerned with being accurate in applying the English they paid good money to learn. It’s the reason why Koreans can sometimes be just as bad as a lot of Asian countries in misappropriating the English language (www.engrish.com/). Editors are vital not only in ensuring grammatical accuracy but also in making sure that contents are appropriate, non-offensive, and sensical (a term which a good editor will catch as not being a “real word”). I’ve been studying Korean and using this book which was published in the country. I imagine it’s designed for foreigners who wish to learn the language in the hopes of interacting with Koreans and perhaps visiting the country. Instead, it gave me an insight into the writer’s xenophobia, lack of sensitivity and outdated grasp of reality. Why would the writer want North Korea to go bankrupt? Doesn’t he/she realize that the country has millions of people, presumably former countrymen, starving? How about the rather casual use of cancer in a language training material? Classy! You also don’t catch cancer like the flu. Your body develops it. As for the bit about Salman Rushdie, I hoped that the book was written in 1989, but sadly, it was written long after Rushdie came out of hiding. Also, why would a news organization report that a writer, who is in fear of assassination, is still in hiding? Who is this news for? Terrorists? This last bit turned me off the most. The book was written by university professors… educators. And yet their jingoism reeks off the page. The Americans are not colonists in South Korea. They are partners. They have just as much to gain from being here as the South Koreans. 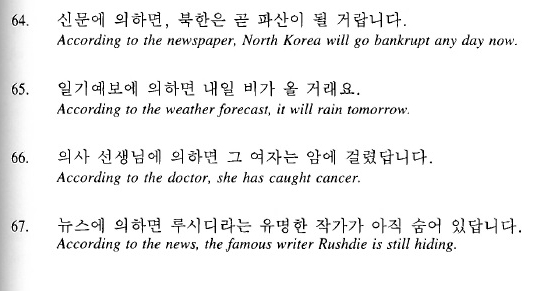 How could such a sentence be of any help to the American wishing to learn Korean? Korean publishers as well as anyone in Korean media using the English language, please hire editors. Hire editors and pay them well.